The only prep required to use this puzzle in the classroom is to copy, cut, and bag. Great for centers, early finishers or intervention groups. Have students work individually, as a team or race. There are many possibilities. Great for spiraling review! 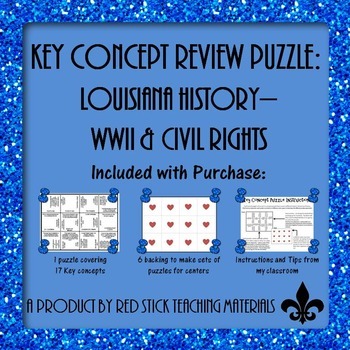 This Bundle will give you access to all current and future Louisiana History Puzzles! Also, remember to leave feedback on all purchases to earn credits towards future TPT purchases.